Designed for individuals who exert more jaw pressure, the Textured Grabber XT® is an Xtra Tough version of ARK's Textured Grabber®. It is constructed of a firmer material, but remains chewy and resilient. 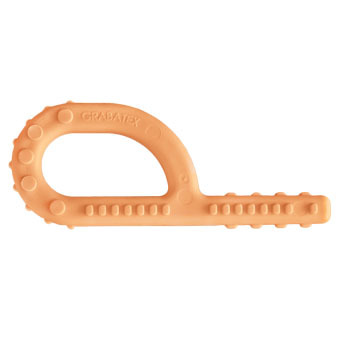 As a mouthing tool, ARK's Grabber® provides an excellent opportunity for the mouth to play through jaw movement, tongue movement, and oral exploration. It can also help with oral defensiveness and food aversions by de-sensitizing the mouth and introducing it to new textures that simulate the textures of real food. Furthermore, it is also a safe and durable alternative to tooth-grinding and/or chewing on hazardous non-food items. Each Grabber® is constructed of medical grade materials that are FDA compliant and contain no lead, phthalates, PVC, BPA, or latex. The resilient material is solid with no through holes or crevices that could harbor bacteria or saliva.